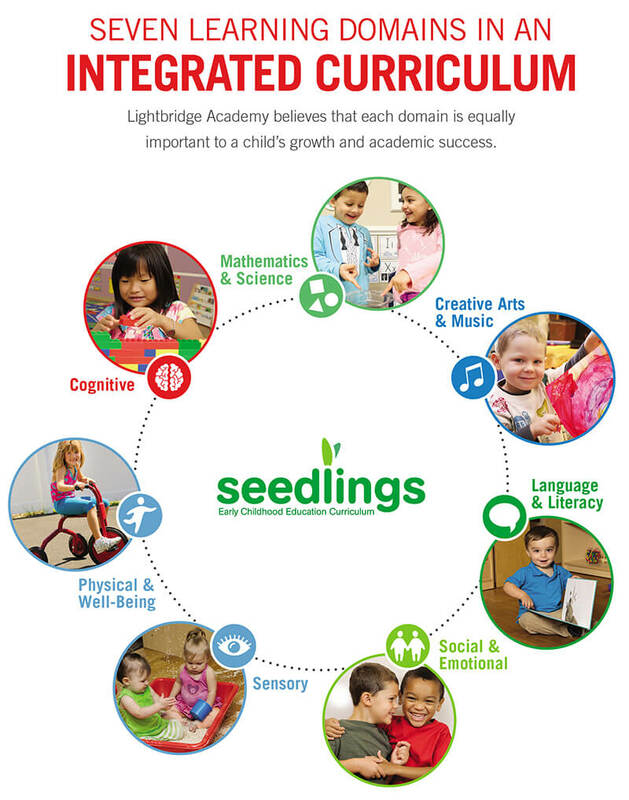 The greatest minds in early childhood education such as Fredrich Fröbel, Howard Gardner, Loris Malaguzzi, Maria Montessori and Jean Piaget serve as the inspiration for our Seedlings Early Childhood Curriculum. Their groundbreaking work is the foundation of ours. Lightbridge Academy has brought these key learnings together in our curriculum to impact the "whole" child in a multitude of ways. By embracing every moment as another opportunity to learn, all developmental areas are met, unlocking every child's potential including academic success. Children thrive and develop in different ways so it is our goal to cultivate a stimulating environment that expands their innate abilities through various learning areas. Our educators encourage children with a "learning is fun" philosophy through play and positive reinforcement and build upon the skills they acquire at various ages and stages of their development. Each classroom is designed with learning centers to offer children the ability to engage in teacher-led activities, child-led interests and individual play. Our lesson plans build on the skills each child acquires at various ages and stages of development, in accordance with the theories of Piaget. Each child is afforded the opportunity to gain information in the way he/she naturally gravitates to, as recommended by Gardner. Aligning with the thinking of Montessori, we focus on the development of the whole child. As Malaguzzi recommended, child observations are respected and used to aid in planning for child-led exploration. In agreement with the philosophy of Fröbel, we acknowledge the importance of play in a child's growth. In annual assessments, 93% of Lightbridge Academy pre-K students have been introduced to, completed with aid or independently mastered the writing, language, math, social studies and science skills taught at the Kindergarten level. Just as with our Circle of Care philosophy, each of the seven learning domains are equally important. Our integrated curriculum ensures that a child advances academically as well as developmentally. Children are introduced to these domains in an age appropriate way where they are able to successfully understand. The Seedlings Early Childhood Education Curriculum focuses on all areas of a child's growth helping them to achieve their full potential. By seeing the letters, signing the words and hearing the sounds, children learn through a multi-sensory approach. STEM (Science, Technology, Engineering, Math) concepts are taught at an early age, encouraging analytical thought, reasoning skills and critical thinking while sparking creativity. Reading & Writing Readiness - features Handwriting Without Tears® with hands-on lessons that develop motor skills and prepares children to read and write. Singing Sprouts - explore music through singing, movement, instruments, a variety of cultures and styles, as well as rhythms and patterns. Spanish Sprouts - learn the basics of counting, colors, readings and every day communication. Signing Sprouts - fosters communication and language development; American Sign Language is used throughout all programs and age groups.